A wide variety of music was presented by Boone Central students in their annual variety show Sunday afternoon, March 1, in the BCHS Gym. Groups performing were the concert choir, jazz band, jazz choir, women’s chorus and the Boone Central Drum Line and Flag Corps. 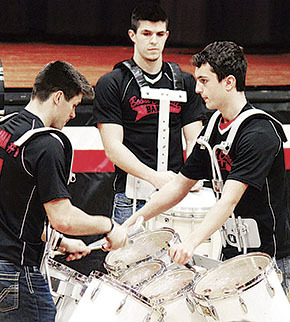 Above, drummers Joe Brugger and Thomas Hosford share the quad toms during the drum line performance. There were 12 solo performances. Vocalists were directed by Michele Wright and instrumentalists by Whitney Paulson.